(Republished by The Press Project, 13/11/2014). An investigation into the party’s finances by a group of lawyers reveals that Golden Dawn had behaved like a criminal organisation even before it entered parliament with the tolerance of authorities. The extreme-right Golden Dawn party finances itself by running protection rackets, blackmailing shop owners, selling weaponry used by its ‘battalion squads’ and by providing services to businessmen, according to the “Civil Action of the anti-fascist movement in the trial of Golden Dawn”, an initiative launched by a group of lawyers after the murder of anti-fascist rapper Pavlos Fyssas in 2013 by a self-declared member of the group. In their declaration, the lawyers have charged that the “the government, the police, the courts and all the “institutions” blatantly tolerated – if not actually supported – the activities of neo-Nazis until the evening of Pavlos’s [Fyssas] murder”. The trial for the September 2013 murder of Fyssas is expected to start by the end of the year. According to a lawsuit filed by the group against Golden Dawn, providing protection was a basic element of the organisation’s activities in central Athens, especially in the district of Ayios Panteleimonas, home to a large concentration of undocumented migrants, which was carried out in cooperation with the district’s police department and its deputy chief Athanasios Skaras. The neo-nazi party’s senior members are currently in prison awaiting trial for running a criminal organisation. The lawyers’ investigation also claims Golden Dawn had expanded its criminal activities even further after it entered parliament as it was given access to state funding. Apart from the funding that parties receive as elected parliament members, it also gained access to a host of other financial privileges as well. Even the vehicles parliamentary parties are given by the state were used in attacks staged by the group’s ‘battalion squads’. The report also notes that it received substantial funding from the military accessories store, Phalanga (phalanx), owned by leading Golden Dawn Member Ilias Panayiotaros which supplied its ‘security units’ and member associations with clothing, badges etc. Golden Dawn were also allegedly granted €300.000-400.000 by ship repair company contractors owners in exchange for trying το break up the Communist affiliated PAME-backed workers union at the shipyard repair zone in Perama, Piraeus with violent attacks against unionists in 2013 with the purpose of dissolving the workers’ collective agreement and setting up another union controlled by Golden Dawn and the contractors. The party has denied all the above charges saying a recent audit of its bank accounts by state tax authorities do not show that it received sums derived from criminal activities. However, according to the investigation conducted by the lawyers’ group, the party concealed its connection to two Cypriot offshore companies. The party’s financial director, Dimitrios Vlachopoulos, was listed as owning two insurance companies with capital share supposedly provided by the two offshores companies. But after an investigation it was revealed that both these offshore companies do not exist – basically the party used two ‘ghost’ companies, which is a well known method of channeling black money. It is yet unclear whether the Cypriot companies were used to send or receive funds to the organization. 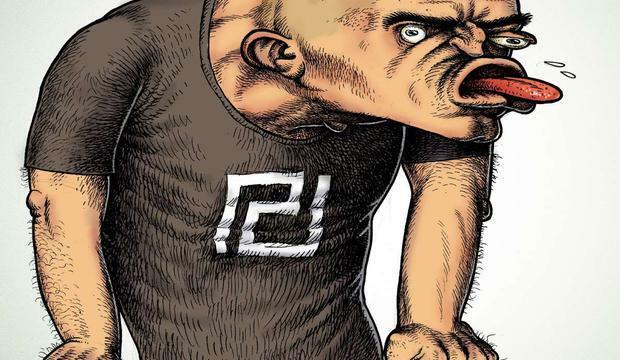 Last month, a Greek public prosecutor demanded in a 700-page argument that Golden Dawn’s entire parliamentary group (18 of them) should stand trial for criminal offences. Golden Dawn had risen from obscurity to enter parliament in 2012, riding on a wave of public anger at harsh austerity and massive unemployment. 14/11/2014 in International, Δίκη Χρυσής Αυγής, Δικογραφία.